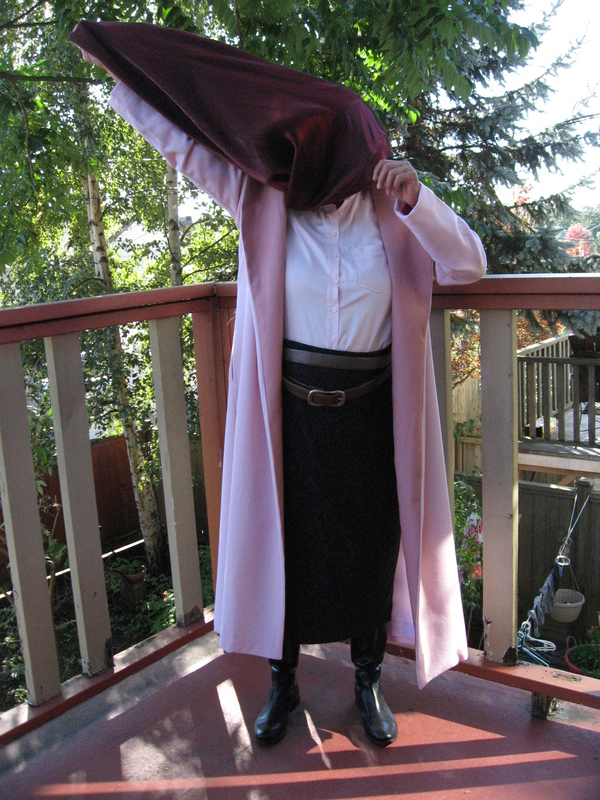 This is a post about a coat, yes it is, but first I’d like to show off the skirt refashion. Altering the chubby Chinese dress turned out pretty well, I thought. There were diamond darts in the back, and I simply converted them to one-way darts, and added two darts to the front. I had to do no other alterations, except add a facing. Voila. 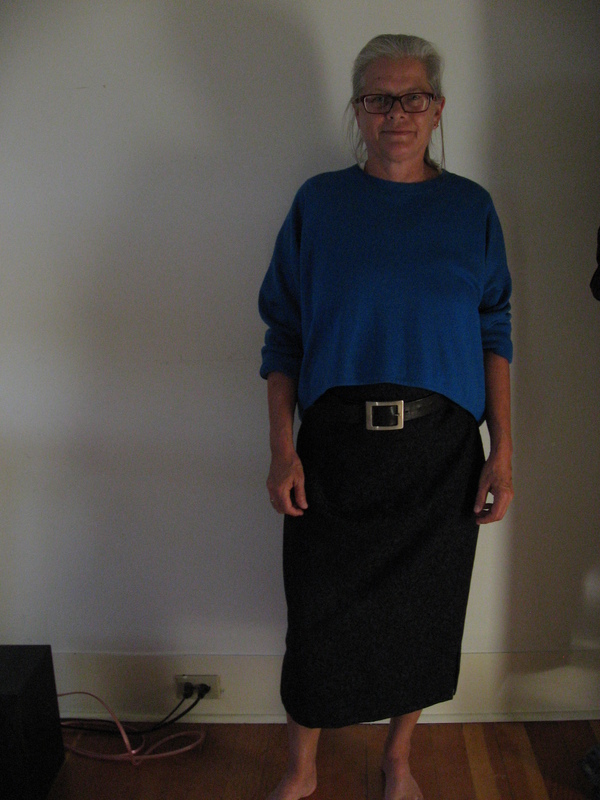 It seems to me like such a sophisticated skirt. The shirt is McCalls 6649, minus the front vertical darts. It’s made from a sateen sheet. I’m not happy with it because the fabric isn’t crisp or stiff enough for this kind of basic button-up. 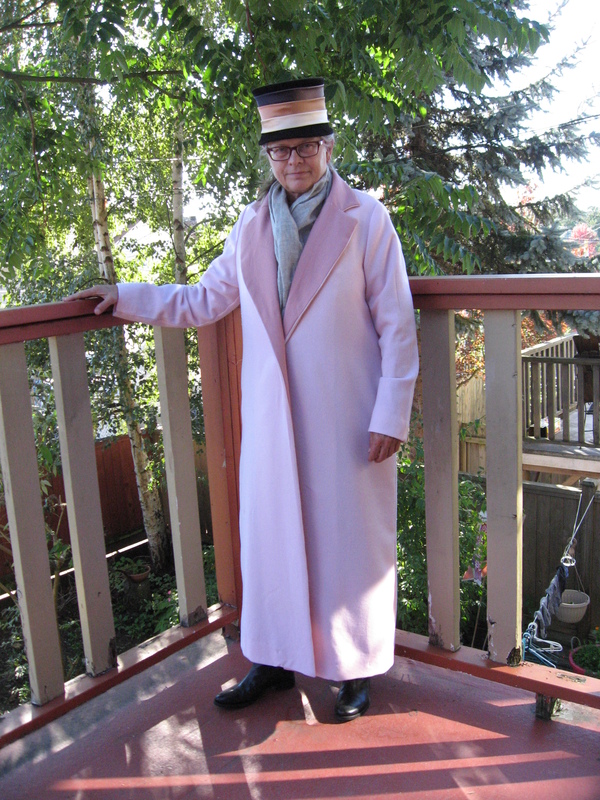 Okay, on to the coat, which is Vogue 8841. 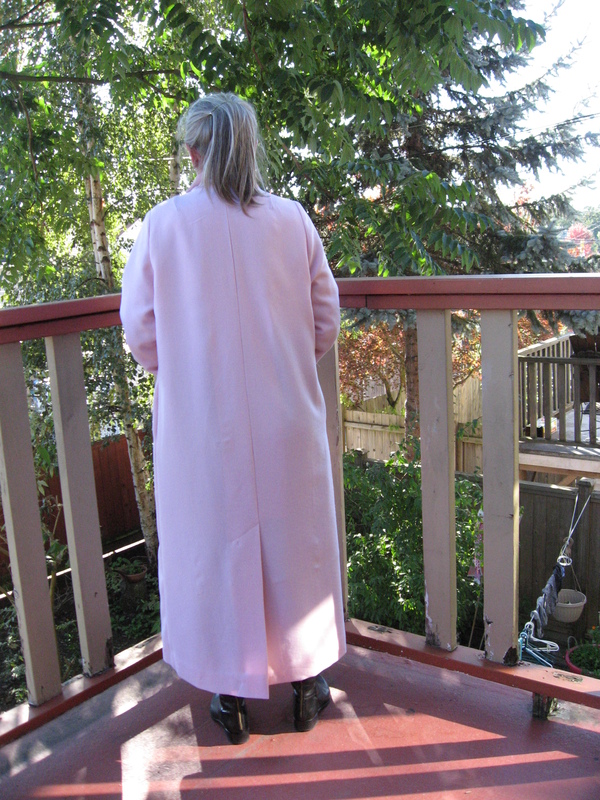 I came across a substantial length of pink wool crepe at My Social Fabrics and a small scrap of matt-back satin in rose. They were so cheap I couldn’t resist. 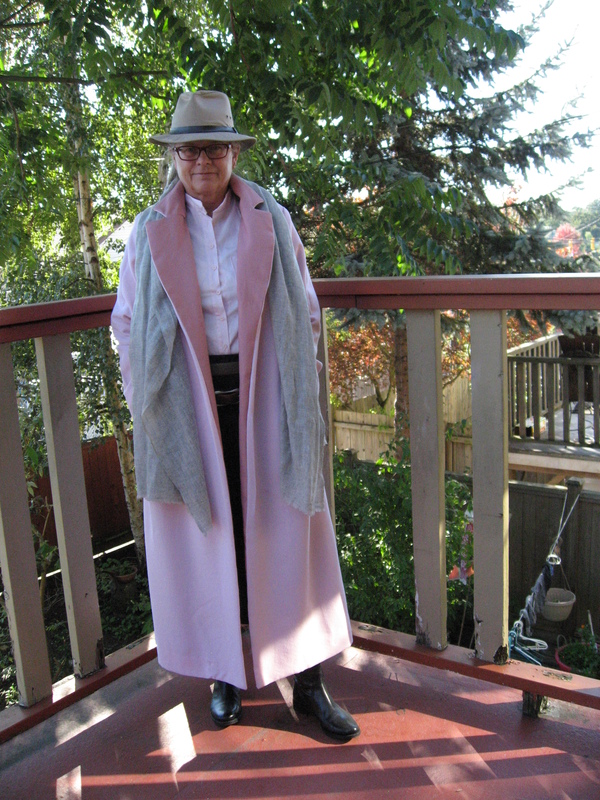 And so, why not try a coat? What was there to lose? Although I didn’t see this as a hard pattern, there were so many firsts that I decided to take it really slow. 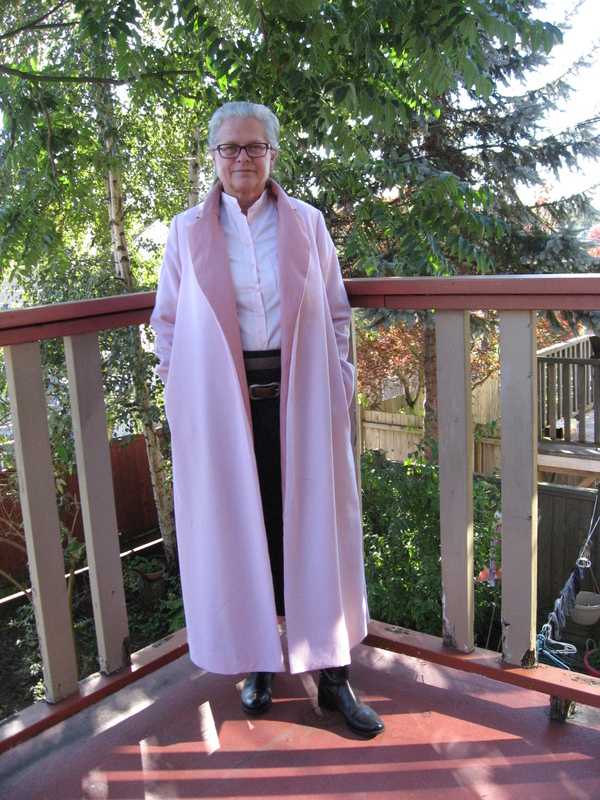 It was my first time to make a coat, my first time to sew a lapel/collar, first time to make a whole lining, including sleeves, first time to make a back vent. But I took it so slowly that it really began to weigh me down by the end. All that zigzag stitching of the seam allowances, sigh. 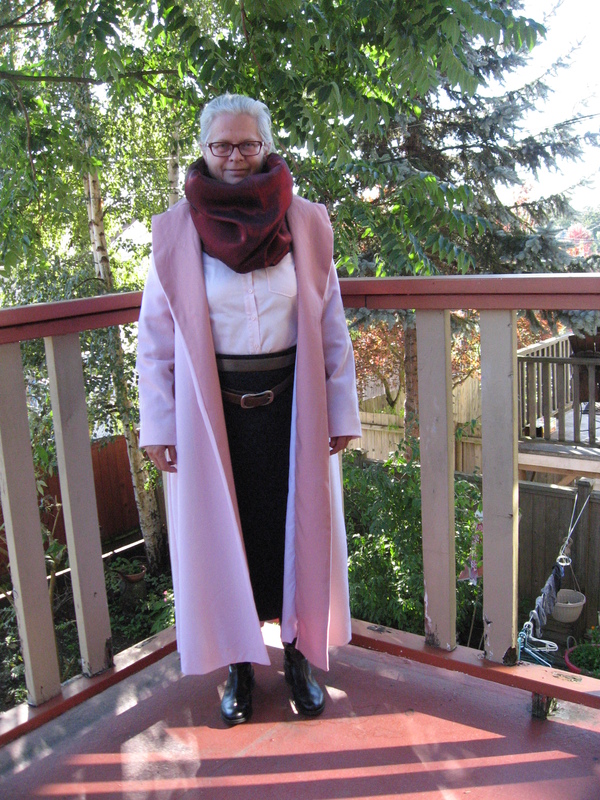 I hand-hemmed the sleeves and the bottom of the coat. 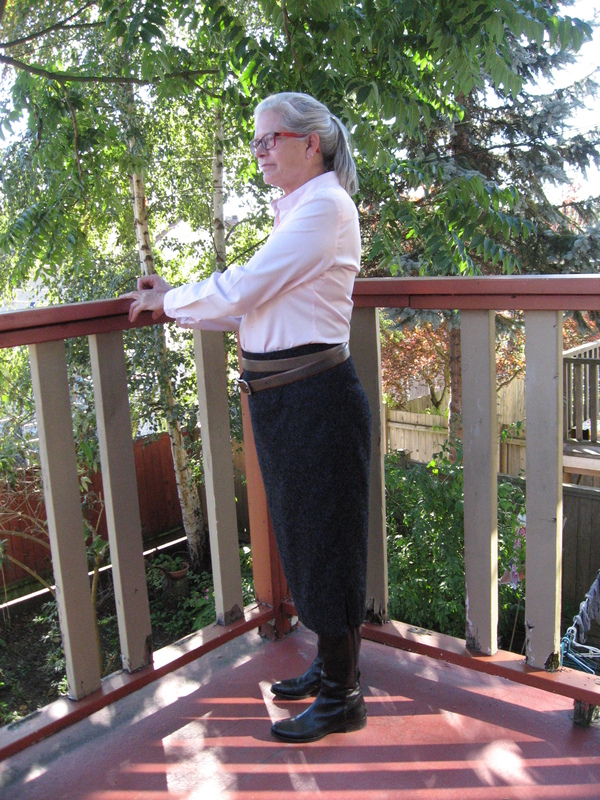 I started out using size 14, but added a bit to the sides for extra room in case I want to wear heavy sweaters or a quilted vest under it. I had to scale the shoulders and arm holes down to a size 12. And I think I didn’t need the extra at the sides either, but better too much room than not enough I figure. I’m becoming friendly with the manager of a new fabric store in my hood, Fabrics, etc. 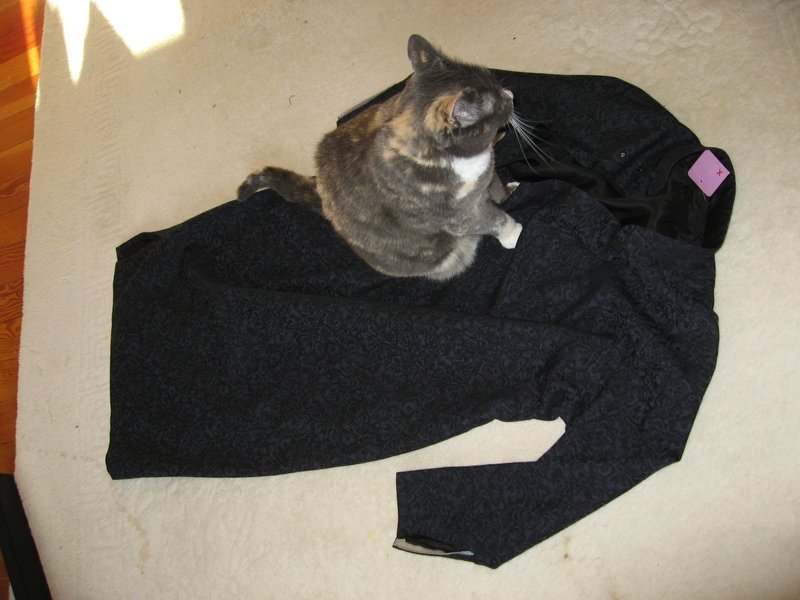 Before starting the coat, I went to him for advice about the lining. 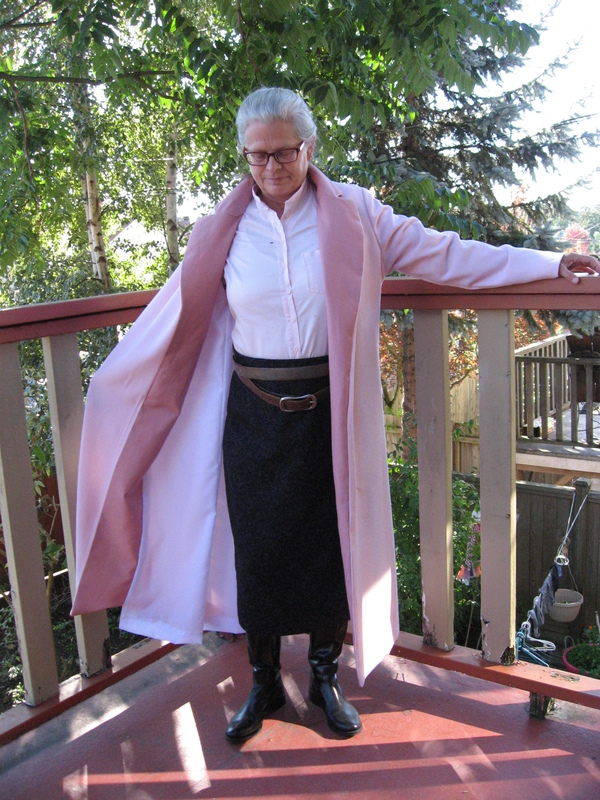 I knew wool crepe would not stop wind, or hold in body heat, so I wanted a lining that would. I had a length of dark green,exterior microfibre, which I thought would be just the ticket, until I held it against the pink and discovered it showed, and muddied the colour of the crepe. He demonstrated the “blow test” for me. To find out how airtight a fabric is, take an edge, press it against your lips and blow. I’ve been doing it ever since, but I have to tell you I wonder how many other women are doing the same thing?? Hygiene, anybody? He also showed me a kind of interfacing I’d never seen before. It stabilizes just the weft. He advised me to use it around the armholes and cuffs. I also used it across the shoulders. 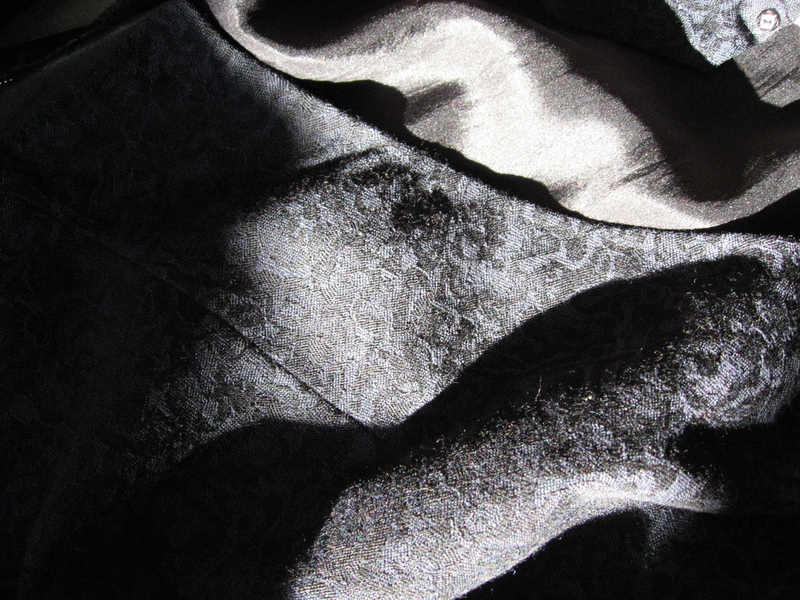 I used a regular woven interfacing for the satin facing. I ended up with a 100% oxford nylon for the lining. Because it’s an oxford weave, it’s not as airtight as you might expect nylon to be (but it’s pretty good), but it has a nice drape and isn’t noisy. I’ve very curious to find out how warm this might be. 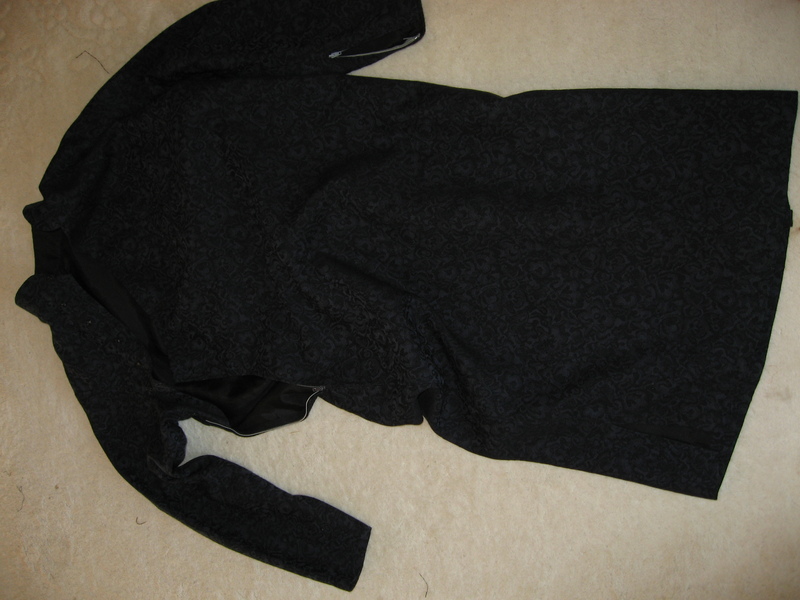 Of course, an airtight lining is only going to do something if the coat closes up tightly. This coat is meant to be held closed simply by a belt. 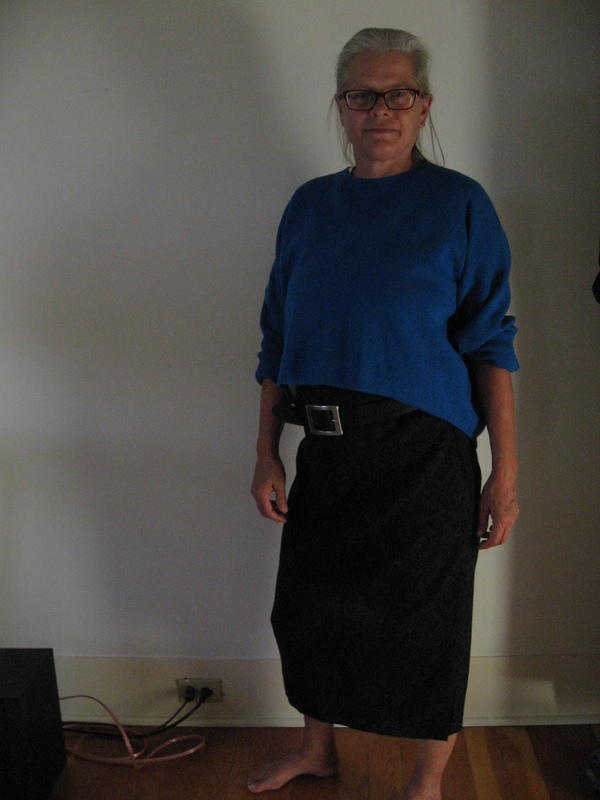 Well, I made the belt, and I tried tying it around my waist and …. horrors! It looked like I’d put a housecoat on over my clothes. I had a horrible image of myself in curlers, fag hanging out of my mouth, reaching out the front door to bring in the milk. Ugh. Hideous. Now I’ve got to try to wipe that image from my mind! So, I tried making a button hole on a scrap of the fabric, and it doesn’t look good. I need bound buttonholes, and although I’ve read up on how to make them, I don’t particularly want to ruin this coat by trying my first bound buttonhole on it. So I’m going with a snap or two. Have I mentioned that I love hats? I have quite a collection, most of which I’ve picked up at thrift stores or yard sales. How could anybody give away that hat?? I love it, but I haven’t had the courage yet to wear it. It’s the kind of hat you don’t wear just to attend the opera — you have to be on stage to wear it. So then I tried to make an infinity scarf out of some gorgeous crimson fabric I had — a shiny fabric that used to be a dress, I think, lined with some organza that I also picked up at My Social Fabric. I just don’t understand what happened. 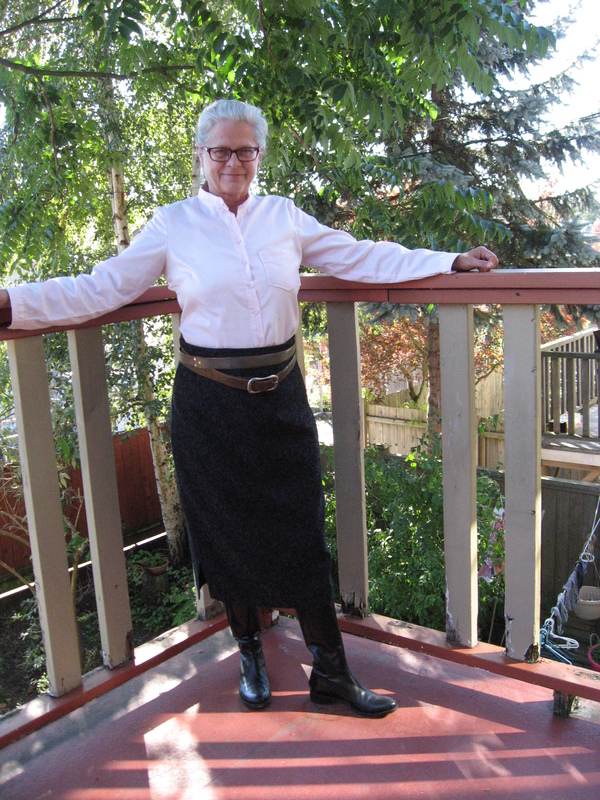 I had four pieces of fabric, two of the shiny fabric, and matching pieces of the organza. I sewed them all together,right sides together, end to end and left an opening at the side to pull it right side out. I ended up with a tube …. If I were a little thinner, I could wear it as a strapless fully-lined sheath dress. Wtf?? (pardon my language) I guess I’m going to have to take apart one of the ends, turn it right side out and then sew the ends together? We’ll see. If anybody wants to make a strapless sheath, just sew a lined infinity scarf and leave an opening at the side to pull out your sheath.